Available only at The Container Store, our Elfa Shelf Pins are used to secure an independent Elfa Solid Shelf to Elfa Solid Shelf Brackets. Elfa Independent Shelf Pins is rated 5.0 out of 5 by 6. Rated 5 out of 5 by MNJen from Graet little pins I used the shelf connectors on the outter shelves and these pins on the inner shelves they really are great for hilding shelves in place! Would these shelf pins work with the ventilated brackets too? 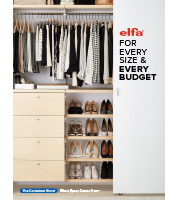 Long story short, I'm trying to customize the Elfa system to fit into my closet to maximize the space. If I used their decor closet shelves (with the brackets) I'd lose 10&quot; of hanging and shelving space (5&quot; on both ends), and I really want to be able to use that. I'd like to use their ventilated brackets with their melamine shelves, and these pins to keep the melamine shelves in place. The reason I want to use the ventilated brackets (as opposed to the solid brackets which are meant to go with these pins) is so that I can use the rods too, for hanging space. Does anyone know this? The shelf pins cannot be used in a ventilated bracket. The solid melamine brackets are designed differently than the ventilated brackets, so they will be incompatible. Our Decor solid shelves, and our ventilated shelves both operate off of the ventilated bracket, so you may want to explore that avenue. If you would like further assistance with your custom design, please call us at 1-800-733-3532. One of our expert designers will be able to better assist you. What is the diameter of the pin that goes into the wood shelf ? Each of our elfa Independent Shelf Pins measures 1/4&quot; in diameter. In which instance would use these plastic pins versus the metal ones? 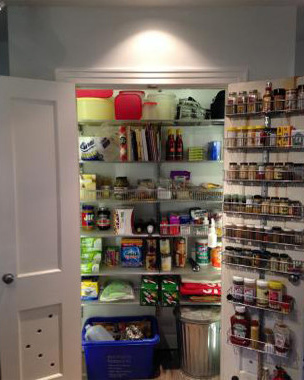 The Independent Shelf Pins are used for single shelves, whereas the metal Shelf Connectors are used for connecting multiple shelves side-by-side. How many pins come in a packet? These pins are sold in a package of 8.